If you are looking to re-vamp your home, a skip could come in extremely useful to manage your waste. A great amount of destruction will be likely to take place; therefore the amount of waste generated will be high and in need of disposing of quickly. Taking numerous trips to the local tip could take hours of time if bits and pieces need to be broken up to them fit in the car, whereas a skip is right on your doorstep. If you are hoping to do a major re-vamp on your garden, a skip would also be highly useful during the process. A recycling bin can only hold so much waste, whereas a skip is far larger and you needn’t wait for the weekly bin collection. We take care of the collection for you once the skip is full and recyclable waste is disposed of by our team. If you are about to move house, there will be tonnes of rubbish and unnecessary clutter that you will no longer need or want to take with you to your new home. Clearing out quickly is often essential when you need to pack up and move. By hiring a skip; extra stress is eliminated from the moving process which can be a real benefit to your well-being. If you would like any further information on skip hire, please contact us today. 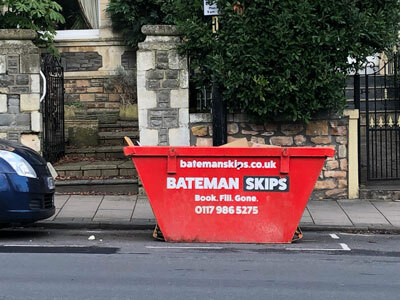 Here at Bateman Skip Hire we have a huge range of skip sizes for all needs and we cover a large range of areas within Bristol and Bath. Previous Post Unwanted household items - what are my options?